The tragedy that happened at Marjory Stoneman Douglas High School in Parkland, Florida is horrific, but the LOVE and support that has poured in from the country is something to be proud of. We are honored to be partnering with the Florida Art Therapy Association to bring art therapist to the students and staff who are looking for a therapeutic art program to begin their road to recovery. Thank you to the Coral Springs Museum of Art for hosting us and providing a safe and loving environment for the community to express themselves. We will be part of the long-term recovery, and you can too. Your Stars of HOPE act as a daily reminder of strength to have hope. The unique approach behind Stars of HOPE is that we took a simple art project and turned it into a public art display in a disaster zone. This allows us to give inspiration and emotional support to thousands of disaster survivors within devastated communities who see these messages of encouragement and compassion throughout the long-term recovery phase of disasters. 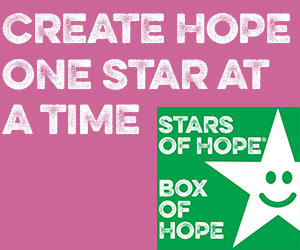 Order your Stars of HOPE Box of HOPE to support the students, staff, and community of Parkland, Florida. Where do I send my Stars of HOPE after I have painted them for Parkland?